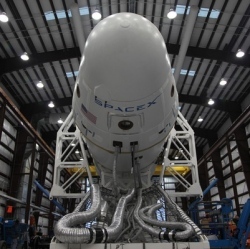 With the recent success of the Falcon 9 launch with six ORBCOMM spacecraft, SpaceX is in the midst of a turnaround of its Cape Canaveral launch site, ahead of the ASIASAT-8 mission. While SpaceX remains on track for a record year, Elon Musk believes the time is coming where there will be thousands of launches each year: as humanity becomes multi-planetary. The recent mission to launch the batch of ORBCOMM satellites struggled to get off the ground for a number of weeks, due to multiple factors such as technical issues, the weather and the availability of the Eastern Range. While the challenges associated with finding acceptable conditions for launch can vary by rocket and launch site location, Florida’s unpredictable weather can upset even the best behaving rocket eager to depart from Cape Canaveral. Eventually launching on July 14, the successful ride uphill resulted in the six new spacecraft all reporting back as healthy, ready to begin their orbital operations. With no time to waste, SpaceX is already into the next flow towards launch, turning around SLC-40 for what will be two launches in close succession for ASIASAT. First to ride on the Falcon 9 is the ASIASAT-8 spacecraft, with its current launch date set for NET (No Earlier Than) August 4.